What had been a somewhat interesting direction begun by writer Peter Tomasi in Outsiders: The Deep comes to a screeching halt in Outsiders: The Hunt. In the title as without, the reason for this about-face seems to be the rather uncertain role the Outsiders (characters and title) play in the DC Universe. As such, this Outsiders volume essentially bows to the whims of both the Batman: Battle for the Cowl and Blackest Night crossovers, and one almost feels bad for the characters being tossed around so much. The end of Outsiders: The Deep actually found the team in much the same position as Nightwing and his Outsiders were once, having publicly exploded an enemy base and in danger of having their covert group revealed. Instead, the previous story gets little mention; the Outsiders return to the Batcave to find themselves locked out and their covert charter revoked, shunted to clean up Arkham baddies escaped during Battle for the Cowl largely just to have something to do. Indeed, that's what those three Cowl tie-in issues feel like -- giving the title something to do. I'm not a stickler for power equality from title to title, but it takes two or three Outsiders to capture each of three relatively minor Batman villains -- Mr. Freeze, Killer Croc, and Clayface; it seems a waste of the Outsiders' (let alone the reader's) time. Tomasi offers a particularly creepy Clayface story, and I liked the Man-Bat cameo in the Croc issue, but none of these are distinctive or memorable outings for the villains. The final two issues cross over with Blackest Night, in that Geo-Force meets the Black Lantern Terra and Katana is attacked by her dead husband and sons. Katana's family has been an important enough part of her character that the sequence is more engaging than the exploits of the evil-and-still-evil Terra; I appreciated that Tomasi, one of Blackest Night's architects, goes even so far as to have Katana discover the Black Lanterns' mastermind through her struggles with the zombies. It's also a good turn that, as in JT Krul's Titans/Blackest Night crossover issues, enemies become friends in the face of the zombies; I liked the nuances of Croc teaming up with Creeper (giving a bit of flow from the Cowl issues) and Creeper himself ultimately betraying Croc. I do think Tomasi missed an opportunity, though, when Geo-Force had to dispatch the Black Lantern Terra, finally acknowledging her evil. The conflict of DC Universe: Last Will and Testament was Geo-Force blaming Deathstroke for corrupting Terra, and Deathstroke wounding Geo-Force lead in part to the hero's tougher attitude in this series. Does Geo-Force "killing" the Black Lantern Terra equal some understanding of Terra's own role in Judas Contract? Unfortunately, that's not explored here in the way I might have hoped. At the end of the book, all the Outsiders go home, and it's astounding given the previous volume's "you will be under deep cover forever" premise. 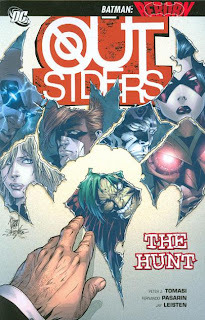 That DC even has an Outsiders book, you'll recall, comes from Judd Winick's 2003 Outsiders that took the "twentysomething heroes" place of Titans; with Titans returned -- and its own concept in disarray -- Outsiders loses the "second generation" role, nor am I sure the "Batman's covert team" concept works either. There's sufficient Bat-family out there (maybe more than sufficient) plus the rumors of Batman's new world-wide recruiting endeavor. With the team benched at the end of this book, and no greater purpose apparent from the book's solicitations, I'll likely pass on the next volume even with the promised New Krypton tie-in; I just don't "get" DC's current version of the Outsiders, or how it differentiates from your average generic superhero team. I'll add one caveat to that. What Tomasi does do well (here and in his writing in general) is bring forth the individual personalities of the character; especially, he never loses sight of how long many of these characters have known and worked with one another. The slowly building conflict between Geo-Force's single-mindedness and Black Lightning's compassion is true to the characters, and I enjoyed the camaraderie between Halo and Katana; even, too, that Tomasi lets Katana admit she's tired on a long drive instead of positing her as an ever-powerful ninja automaton. One thing I'll give the Outsiders is that they're truly believable as a family; I just wish The Hunt had the force of will and purpose that Outsiders seems to have lost some creative teams ago. Up next we're rocking Red Robin (it did have to be said) and then some New Krypton and Justice League. Don't miss it! This run never took off for me, but the current Outsiders run by Didio is so incredibly bad, it makes me wish Tomasi had stayed on this book. I guess this collection is a good dropping off point. Exactly how I feel. I have this nostalgic love of the Eradicator character from his Superman appearances way back, but I don't believe I'll be picking up the next volume any time soon for that purpose -- maybe discounted at a convention. I am just not seeing the draw of this series -- though, if someone's still reading it, I'm always curious to hear what appeals a series to other readers. Tomasi's first volume felt so bold and rich in potential. The second collection was a big disappointment and I picked up this one to complete his run. The same day I got this I bought his Nightwing: The Great Leap trade. This was such a let down compared to that. The characterization felt obliged rather than inspired and I got the sense that he was stuck with the bat-villains still available after the bat-books had called dibs. I too, will be calling it a day for Outsiders collections, replacing this spot is Giffen's Doom Patrol which is far more enjoyable (though I'll be surprised if it makes it through the 20s issue-wise). Morbidly anticipating your review of Team History. Where does DC UNIVERSE: LAST WILL AND TESTAMENT get collected in? @AaloK: It doesn't get collected, thankfully. That was where Brad Meltzer tried to force through his retarded "Terra wasn't evil, just drugged" retcon that was summarily thrown out. It was better left forgotten; it didn't even really jive with what was happening around the time it came out anyways. Exchanging Doom Patrol for Outsiders is a good suggestion, one I too might take up. Aalok, as dl said, DC Universe: Last Will hasn't been collected anywhere -- however, it does get referenced, especially in Outsiders: The Deep. Also, the Faces of Evil: Deathstroke special follows from the events of Last Will; that story is collected, very belatedly, in the Teen Titans: Ravager trade. The DCU #0 narration isn't collected anywhere; as far as I know, just the Batman and Wonder Woman parts are collected. More's the pity -- that story, if you read it right, bridges Countdown, Final Crisis, and Seven Soldiers. ... Was Blackest Night #0, the story part, never collected anywhere? The Blackest Night hardcover opens with the story part of Blackest Night 0. The color corps profile pages are interspersed in the Tales of the Corps HC. Last Will and Testament is the most significant story about Brion Markov I can think of. Pity it's subject to this controversy over Terra. It really should have been the opening story in Outsiders: The Deep. I've read Last Will and Testament, but not The Judas Contract or any Outsiders books, so forgive me if I'm way off base here...but doesn't Last Will suggest that Terra wasn't all bad, in Geo-Force's eyes? i.e. it wasn't a retcon, but just showing a brother trying to get revenge for his sister, whom HE perceived to be innocent? Marv Wolfman made no two bones about it....TERRA was evil. This issue (LW&T) was somewhat similar if only in theme to TALES OF THE NEW TEEN TITANS # 55 SHADES OF GRAY....it was a two parter from 54 & 55 where Beast Boy wants to see Slade out of prison during the Trial of the Terminator so he can kill him for what he did to Terra....if it wasn't obvious enough in JUDAS CONTRACT Marv sealed it here. It was a denial thing. Geo-Force wouldn't accept that she was truly evil, so he blamed Deathstroke. Then Last Will & Testament tried to say Deathstroke drugged her, if I remember right. It was then summarily forgotten. DC wouldn't even collect it; and they originally intended to. This volume of Outsiders forced him to accept that she was evil. This brings in mind another issue in my mind. I'm quite confident that TERRA INCOGNITO would tell me about what TERRA was before the JUDAS CONTRACT,and the selfsame trade carries me further. She died, right? Then I can remember another Terra in the NEW TITANS,still another after ZERO HOUR & a trade called TERRA by GRAY/PALMIOTTI & now LW&T. Can anyone tell me in chronological order how this makes sense? The real Terra died in Judas Contract. The one tooling around when Zero Hour was going on was pretty much just DC trying to appease those mad that Terra really was evil and not just misguided. The character served little to no purpose and was more or less useless. Black Adam decided it would be a totally slammin' idea to punch her through the sternum. She was summarily forgotten. The current Terra is almost completely unrelated to the previous ones. She's mostly a Power Girl supporting character. Kind of like PG's sidekick. And to bring this thread full circle, the new Terra mini-series had a different explanation for the original Terra's evil, that was contrary to the Meltzer story as well. The new Terra mini was however, lots of fun. The series is as free from angst as you can get. Great cameo by Doctor Midnite and it set up the new Power Girl series like a 0 issue. Any chance dl316bh dislikes the Zero Hour Terra so much because she would rival Raven for Beast Boy's affections? ... I kid. Check out dl316bh and the Beast Boy/Raven community at http://main.the-bbxrae-shrine.net. I do have to stand up for the Terra clone, though, who was a member of the short-lived Team Titans, one of my historically favorite super-teams. The Team Titans were "teen" Titans from the future at a time when the New Titans had become a little long-in-the-tooth, and there was a great mystery involving their time travel and their mysterious leader that was cut short, unfortunately, by Zero Hour. That Terra had to struggle mightily displaced from home in a time where everyone thought she was a super-villain; I think that whole series is worth checking out. @collecteditions: It's not that man. I know you're kidding, but I feel I should explain. I have strong opinions about the Terra story. Having someone around who could be the original and is basically a carbon copy except not a sociopath just strikes me as a dillution of the Terra storyline. It's part of why Marv Wolfman didn't want to create her to start with and I have to agree with his reasoning. In the end, she never really did much either, accept dredge up bad memories for Gar until he basically told her to take a hike from his life in general. It's part of why I hate it when some folks want to try and make the original Terra misguided or manipulated (see Brad Meltzer, though I have nothing against him personally). It's like they missed the entire point of Judas Contract. Not to mention the growing up Beast Boy was forced to do during the whole Trial of Deathstroke thing. It's just a very strong dislike of messing with the Terra concept in general. I agree with that (just have much love for the Team Titans). To me the original Terra represents "pure evil" -- a person with the sole intention of doing ill; in the comics context, the Joker is another one of those. I disagree with Meltzer's apologizing for Terra; that, like Beast Boy, is trying to see what one hoped to see in the character, rather than what she really was. I think, for all the good versus evil in the DC Universe, "pure evil" is still a tough thing for some readers and writers to fully accept -- even Lex Luthor and Deathstroke have been written with their moments of goodness. For me, this is why Terra's story is so compelling; even as the New Titans all struggled against their darker natures, Terra was the character completely devoid of that spark of goodness. Similar to the expanded Legion: Great Darkness hardcover, I'm hoping DC reprints Terra Incognito and Judas Contract (and maybe some of the follow-up issues) all together in one story. That would be nice. Actually, one of the things I find annoying when it comes to DC's trade department is that the New Teen Titans era doesn't have a comprehensive set of trades. It's been largely ignored barring a trade of the occasional big storyline. To me, it's like if Marvel didn't bother collecting the Claremont era in any semblance of detail. You make a good point about "pure evil" not being a common concept in the DCU. Even the worst villains seem to have their times where you might sympathize with them a bit. See Flashes Rogues, for instance, whom are technically evil but have a strict code of ethics and are difficult to hate outright. In a way, the rarity makes villains like Terra, Joker and Braniac, for examples, more effective. The first one brought nothing good to the lives of the Titans when she was walking the earth and when the latter two show up you KNOW things just got real. Speaking of the Great Darkness Saga, I still need to read that. I managed to pick up a copy of the original trade a ways back. I was at New York Comic Con '08 and they were selling copies that Paul Levitz had in his personal collection, with certificates and everything. It's really the only Legion story I have, as that concept just seems utterly impenetrable to me. Still, I figure I may as well read the story considered a high water mark in its history; and hey, Darkseid too, so what the hell right?